Welcome to your new favorite ingredient. You're welcome. I used to be such a wimp when it came to heat. Now I can't get enough, and Calabrian chilies* were the game changer. I first encountered them at one of my now favorite Italian restaurants in North Beach. I was having dinner there with Jack and sitting on the table was a little jar filled with them. Jack, a big fan of spicy food, told me these chilies were one of the most delicious things he'd eaten on his trip to Italy, but when he tried to get me to try one I was like heck no. "You don't know what you're missing out on," he said. Thinking they were super spicy, I dared him to eat a whole chili. When he easily downed it, I naturally dared him to keep going. Four chilies in with no smoke coming out of his ears made me wonder just how dangerously spicy these chilies actually were so I tried a tiny bite of one. 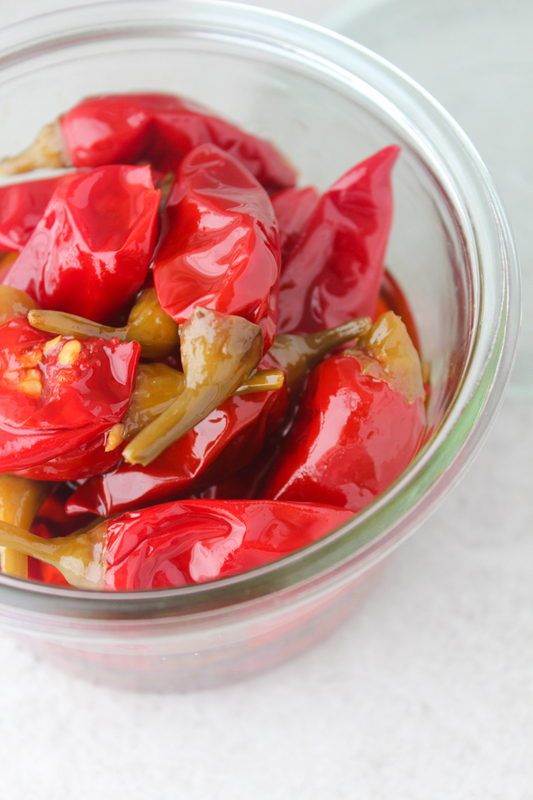 Calabrian chilies are infused with oil and salt, making them taste somewhat similar to olives but with a bit of a vinegary, smokey taste. Jack describes them as a cross between a chili and a caper. Their heat is strong but definitely not over the top. That night at dinner, I became so obsessed with them I ate chili after chili. Whole. On their own. Straight out of the jar. I couldn't get enough. This coming from a self proclaimed hater of all spicy food. Heat is all relative, so I'm not suggesting you buy a jar and start downing chili after chili (though that would be pretty awesome). 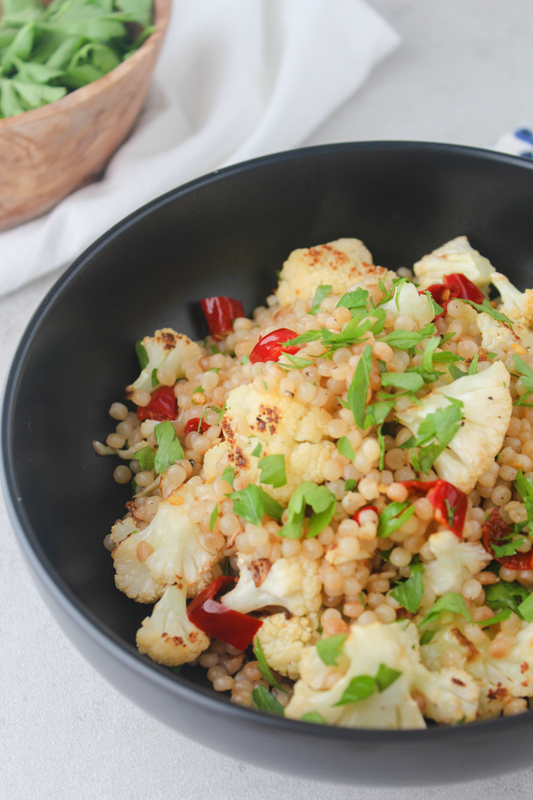 The perfect place to start is with this recipe for Roasted Cauliflower and Israeli Couscous with chopped Calabrian chilies and a bit of the chili oil. You can modify the amount of chilies and oil you add to suit your liking but fair warning, if you think you don't like spicy food, that's all about to change. *Calabrian Chilies can be a bit difficult to find, so I suggest purchasing them here on Amazon . 1. Preheat oven to 425 degrees. 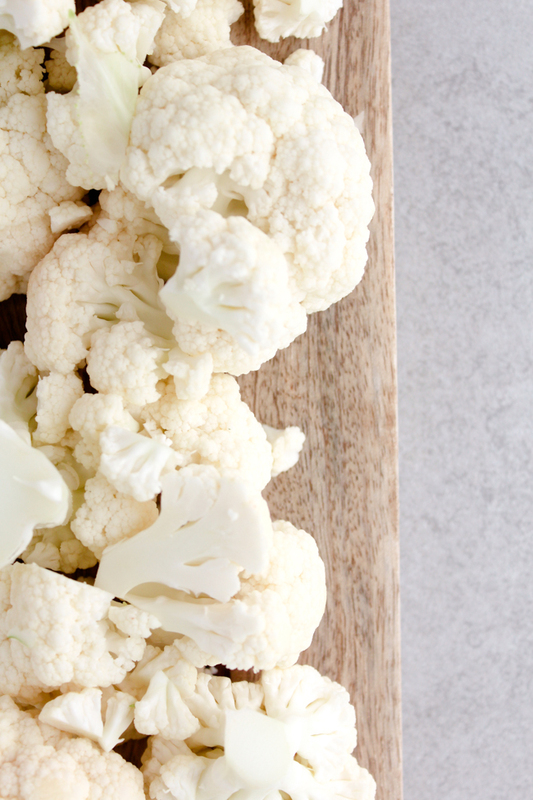 Lay cauliflower florets out on a baking sheet, drizzle with a bit of olive oil and sprinkle with garlic powder, salt and pepper. 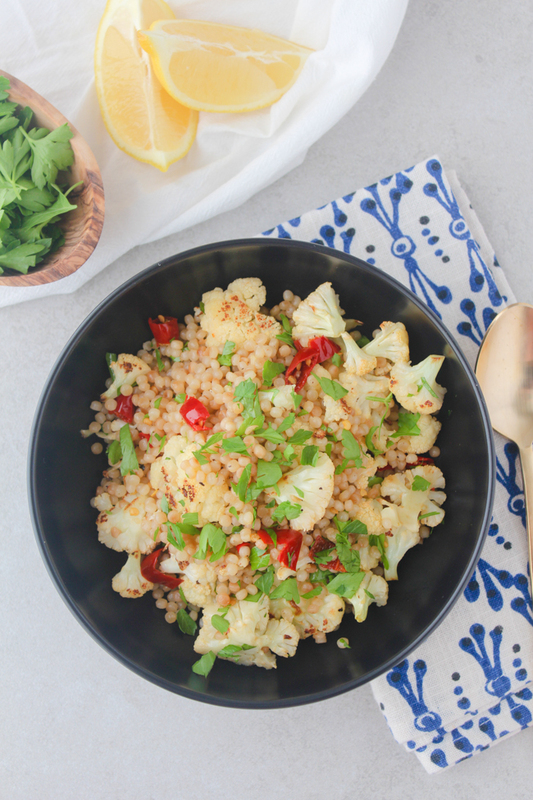 Roast cauliflower in the oven for about 15 minuets. 2. Saute couscous with 1 tablespoon olive oil over medium heat until it's lightly browned (about 5 minutes). Slowly add the boiling water and bring to a boil. Reduce heat to medium low and cover. Simmer for 12 minutes or until liquid is absorbed. 3. 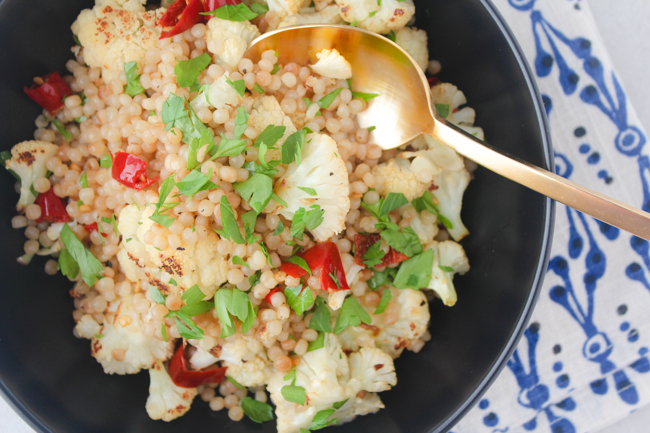 In a large bowl, stir together cauliflower, couscous, chili peppers, chili oil, parsley and the juice of half the lemon. Divide into bowls and squeeze remaining lemon juice on top. It's so yummy! I hope you try it! 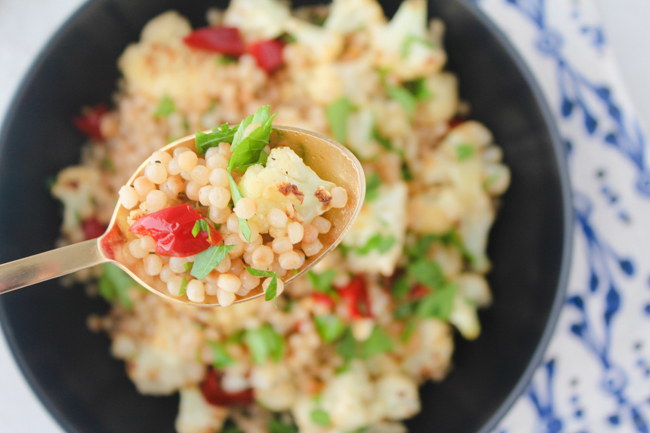 I love Israeli cous cous and can't wait to give this a try! Your photography is gorgeous too!! Thanks so much, Jean! 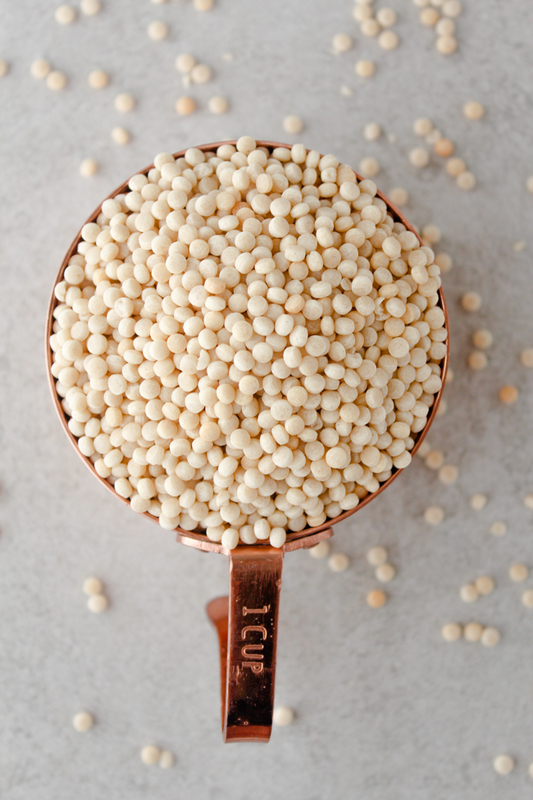 I've recently become obsessed with Israeli couscous, its got such an amazing texture! It's super good and very easy to make! It's also easy to find at any grocery store :) Let me know if you have any questions! 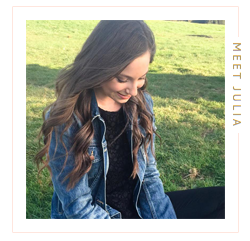 Always love your perfect photos and your amazing recipes! This one looks delish my friend!! You're so sweet, Dana! It really means a lot, thank you so much!! I hope you do! Be sure to let me know what you think! Thank you! Definitely give it a try, it's amazing!